Signed and dated u.r., oil "Alma Tadema 1870". Private Collection, pre 1977, Texas/United States of America, Sold 1977. John and Julie Schaeffer, 07 Nov 1997-Feb 1999, Sydney/New South Wales/Australia, Gift of John and Julie Schaeffer 1999. Purchased by Mrs and Mrs Schaeffer at Christie's London, 7 Novemeber 1997 'Fine Victorian pictures, drawings and other works of art', lot 85 - 'The property of a gentleman'. Russell Ash, Sir Lawrence Alma-Tadema , London, 1989, np, col illus pl 3. As 'Egyptian Juggler'. Atkinson J Beavington, Blackwood's Edinburgh Magazine , 'Contemporary art – poetic and positive: Rossetti and Alma-Tadema – Linnell and Lawson', Edinburgh, Mar 1883, pp 392–411: p 403. Richard Beresford, Pre-Raphaelites and Olympians: selected works of Victorian art from the John and Julie Schaeffer and the Art Gallery of New South Wales collections , Sydney, 2001, unnumbered, pp 5, 46, 48, col illus p 48. Christie's London (Editor), Fine Victorian pictures, drawings and other works of art , London, 07 Nov 1997, p 68, no 85; col illus p 69 and on cover. Lot. 85. Robert Dein, Look , 'The gladiator connection', Melbourne, Nov 2000, p 13, col illus p 13. Rudolf Dircks, Art Journal , ‘The art annual: the later works of Sir Lawrence Alma-Tadema’, London, Dec 2010, p 27. Algernon Graves, The Royal Academy of Arts: a complete dictionary of contributors and their work from its foundation in 1769 to 1904 , London, 1905-1906, vol 1, 1905, p 28. Terry Ingram, Australian Financial Review , ‘Saleroom: Juggling act in the art of giving’, Sydney, 14 Jan 1999, p 26, illus p 26. Bruce James, Sydney Morning Herald , ‘Flies in the face of reality’, Sydney, 24 Apr 1999, p 12. Peter Raissis, Look , 'Victorians in togas', Melbourne, Mar 1999, pp 6–7, col illus p 7 and on cover. The image appearing on the cover is a detail of the work. Michael Reid, Weekend Australian , ‘Art market: treasures go public with tax breaks’, Canberra, 13 Mar 1999-14 Mar 1999, p 4, illus p 4. Michael Reid, Weekend Australian , 'Give the artful tax dodger a break', Sydney, 27 Nov 1999-28 Nov 1999, p 35, col illus p 35. [F G Stephens], Athenaeum , 'The Royal Academy (second notice)', London, 07 May 1870, pp 618–19. A.G. Temple, The art of painting in the Queen's reign, being a glance at some of the painters and paintings of the British school during the last sixty years , London, 1897, pp 192–93 (as ‘Un Jongleur’), illus opp p 192. A.G. Temple, Catalogue of the loan collection of pictures by painters of the British school who have flourished during Her Majesty’s reign , London, 1897, p 64, no 104. A G Temple, Magazine of Art , 'The Gassiot Bequest to the City of London', London, 1903, pp 518–20: p 520. Catalogue des tableaux modernes de la collection de Monsieur le Baron N A Steengracht van Moyland à la Haye ... , Amsterdam, 10 Sep 1895, p 64, no 102, illus as frontispiece. Eigen Haard , Netherlands, 1895, p 600, illus p 601. Catalogue of the highly important collection of modern pictures and water colour drawings of the English and continental schools of Stephen G Holland esq, deceased, late of 56 Porchester Terrace, W. , London, 25 Jun 1908-29 Jun 1908, p 23, no 110. Highly important Victorian paintings and drawings , London, 19 Mar 1979, p 59, no 28, col illus p 58. Catalogue does not specify vendors. Unknown and Unknown (Editors), ‘Imagining Rome’: British artists and Rome in the 19th century , Bristol, 1996, pp 136–38, no 48. Christie’s International Magazine , London, Nov 1997, col illus p 107. Art Gallery of New South Wales annual report 1999 , Sydney, 1999, pp 6, 20, 52, col illus p 6. Unknown, Lawrence Alma-Tadema , London, 2001, pp 48, 52, 57, 91, 147, col illus pp 1 (detail), 43. 19th century European art including the orientalist sale , New York, 23 Oct 2008, col illus p 316 (under no 179). Art Gallery of New South Wales annual report 2000 , Sydney, 2000, p 19. Art Gallery of New South Wales annual report 1999 , 'Director's Introduction'; 'Collections: European Art Before 1900', Sydney, 1999, pp 6, 20, col illus p 6. Unknown, Edward Morris, Elizabeth Prettejohn and Julian Treuherz (Editors), Sir Lawrence Alma-Tadema , Amsterdam, 1996-1997, pp 156–59, no 20, col illus p 157. The biography and catalogue raisonné of the paintings of Sir Lawrence Alma-Tadema , London, 1990, p 156, no 119. As 'location unknown'. The Magazine Antiques , New York, Mar 1978, col illus p 470. Maurice Sternberg Galleries advertisement. Unknown, Sir Lawrence Alam-Tadema: the painter of the Victorian vision of the ancient world , London, 1977, p 136, no LXXVII. As location unknown. 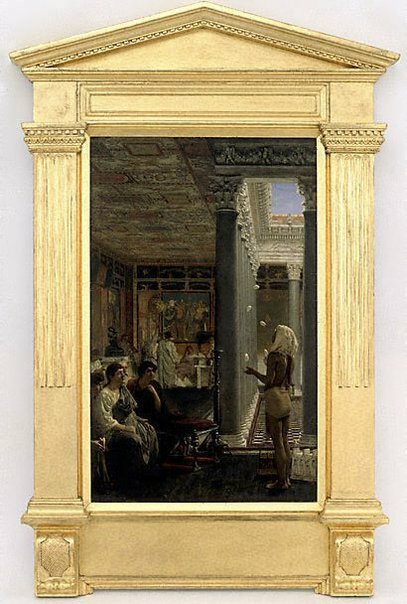 Sir Lawrence Alma-Tadema, OM, RA , London, 1905, pp 50, 72–73, illus opp p 50. Illustrated London News , London, 14 May 1870, p 503. The exhibition of the Royal Academy of Arts, MDCCCLXX, the one hundred and second , London, 1870, p 12, no 153. Times , ‘The Royal Academy exhibition (first article)’, London, 30 Apr 1870, p 12. British painters of the eighteenth and nineteenth centuries , London, , p 138. The Grosvenor Gallery: winter exhibition , London, 1882-1883, p 9, no 27. Athenaeum , ‘The Grosvenor Gallery exhibition’, London, 09 Dec 1882, pp 778–80: p 779. Unknown, The art annual: L Alma Tadema Royal Academician: his life and work , London, 1886, p 13. Catalogue of the first portion of the valuable collection of modern pictures and water-colour drawings lately the property of the Messrs Murietta , London, 30 Apr 1892-03 May 1892, p 23, no 149.